A motorist was critically ill in hospital tonight after a serious collision on the M61. Emergency services were called to the southbound carriageway of the motorway between Clayton Brook and Chorley, following the incident at about noon on Friday. Police said a Ford Transit van collided with a car in the third lane before veering across the hard shoulder and down an embankment. The driver was recovered and taken to Royal Preston Hospital. 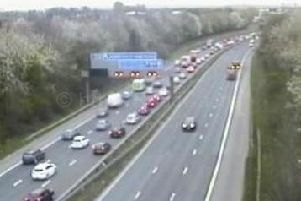 All three lanes of the carriageway were initially closed between J9 and J8, before one lane reopened shortly before 1pm. Delays were continuing thoughout the afternoon but the motorway was clearing this evening.